This is very different to my usual style, but I thought it was time I did some brighter cards (yes, I'm working on the male cards too). I wanted a bright and happy card for a friend, and this colour combination is Marigold Morning, Tempting Turquoise and Rose Red. The floral stamp set I have used is Time Well Spent. 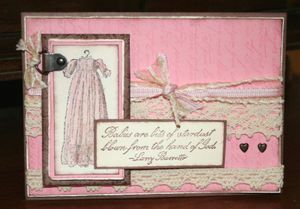 This is a level 3 hostess set that will be in the new 2008/2009 Idea Book and Catalogue. It is a beautiful 11 piece stamp set and we were lucky enough as demonstrators to be sent the set fro free late last year as a thank you from the Stampin' Up! CEO, Shelli. How amazing is that? They treat us so well! The greeting is from the Lots of Thoughts Saleabration set. I've had a big day today - school/creche drop off and some stamping and chatting with some of the girls in the team. Time for a quiet family night I think :). Hope you have a nice night too. I'm a bit sad to see this Stampin' Up! set Buggies and Booties retiring before I really had a chance to use it in workshops etc. It's a great vintage set if that's your style, and is great for watercolouring as well. It would suit a baby card (it also has other images of vintage prams, booties and rattles so would suit a boy too) and also would be great for a christening card with this beautiful gown image. I have used Close to Cocoa (this is fast becoming one of my favourite colours) as well as Pretty in Pink and Very Vanilla. 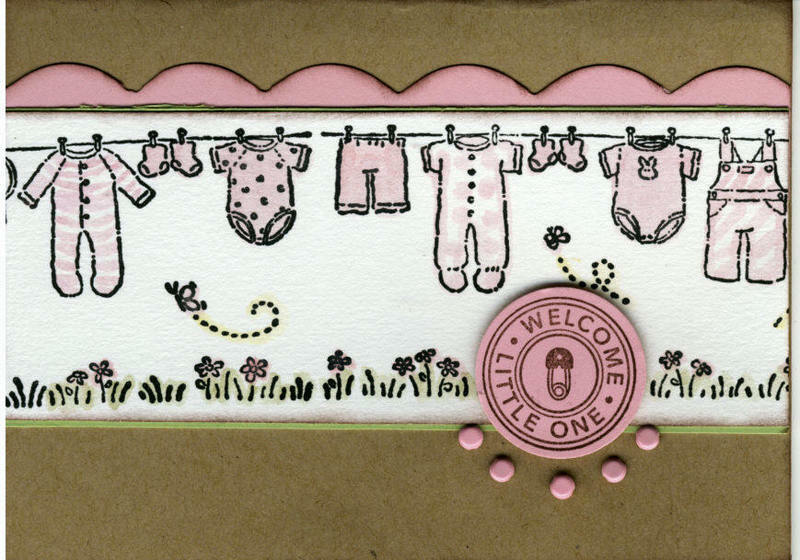 I have stamped the background pink layer using the French Script Background (also retiring - what were they thinking! ), and then matted in Very Vanilla. The main image is watercoloured using the crayons (just used Pretty in Pink), inked and matted with Pretty in Pink, Very Vanilla and Close to Cocoa (which had been embossed in the Cuttlebug). Then finished off with the sentiment in Close to Cocoa, and some pink gingham ribbon and hodgepodge with lace, brads and other ribbon from my stash. The retired list has been updated some more and I will update it again in the morning. Sorry about the formatting - don't have time to retype the whole thing! Going going gone - the Stampin' Up! 2008 Retired List is here! Each year around the 1st March Stampin' Up! release their list of stamps and accessories which won't make it into the new catalogue which commences 1st April. This year they released it early. Once these stamps are sold out, they are gone for good, so if you have had your eye on anything on the list, it's probably wise to get in quick. I'm a bit sad to see some of my favourites on the list. I have created a page here with the complete list of stamps and accessories, and will be updating it as new versions are posted on the demonstrators website. That way you will be getting the very latest version of the list. Some items have already sold out and these are listed in red, while items getting very very low are in yellow. So tonight, I've decided to repost some of my cards from the last year which highlight some of my favourite retiring sets. I can't see myself letting go of these sets! 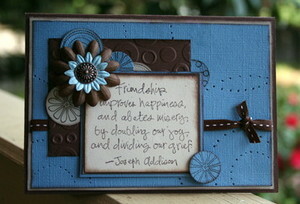 For starters, there's Friendship Flowers, a great quote set I have used so much. These are so versatile and such lovely quotes. Its on page 113 and is only $45.95. Then there's Terrific Tulips, a happy bright set with stems and many different flower stamps of tulips in different stages of opening. This set is great for spritzing, two step stamping and colouring with markers. This one is on page 76 and is $49.95. This card also features one of the 6 retiring 'In-Colour' cardstock colours (page 127), Cool Caribbean (used to mat the white). If you need to stock up on this cardstock, or have ink-pads and need re-inkers, you need to buy these now as they will no longer be available after March 31st. Instead I anticipate we will be getting 6 new 'In-Colours'. The 48 standard colours will remain unchanged. Next I have Kanji which is on page 93 and only $23.95. 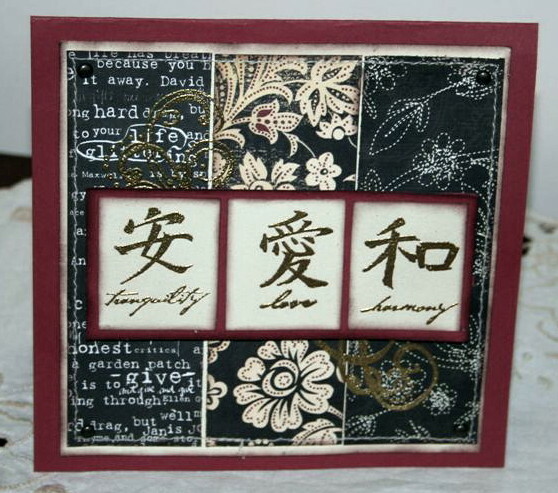 I love the oriental look of this set and it goes wonderfully with kraft, basic black and real or ruby red cardstock colours. 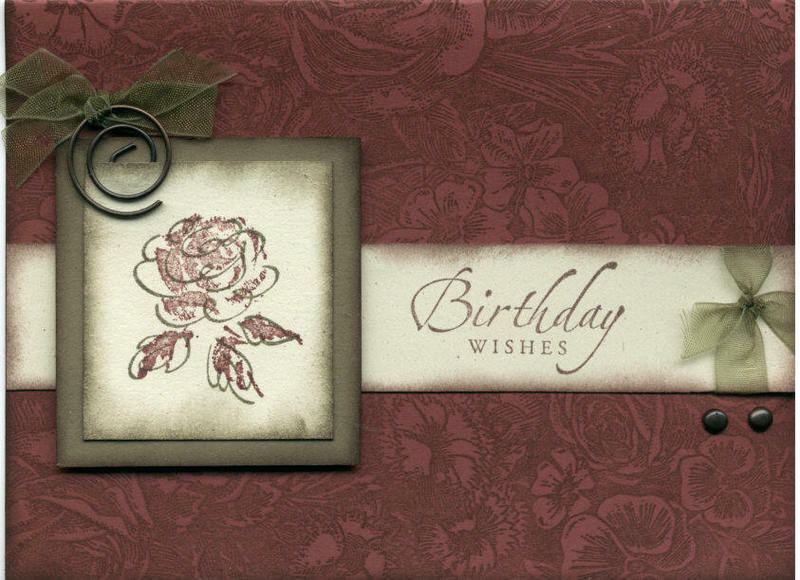 In this card I have embossed the symbols, and used embossing on patterned paper (the swirl stamp is not included in the set) as a background. This is a great way to use up your patterned paper scraps (but be careful you don't emboss too close or you may burn the paper). Next we have Simple Sketches (used in the main image - the background and greeting stamps are not being retired) which is on page 42. 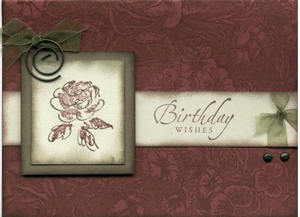 This is a set of 12 stamps including 3 greetings and costs $59.95. Oh how I love this set! It's perfect for me as I love everything floral and old and traditional. 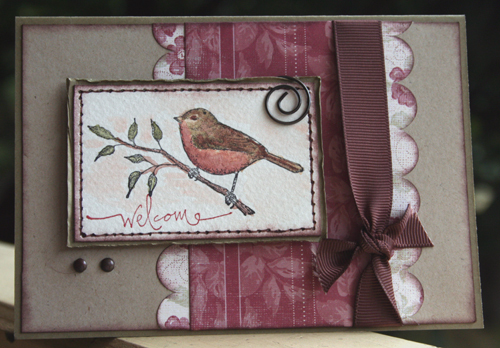 This card also features two of the retiring 'In'Colours', True Thyme and Cranberry Crisp. The olive organdy ribbon (and all the other colours of organdy ribbon) are also retiring. Quite a few of the wheels are also going, including this cute 'Washday Wheel' jumbo wheel which is on page 151 and $15.95. I'll miss that as well! 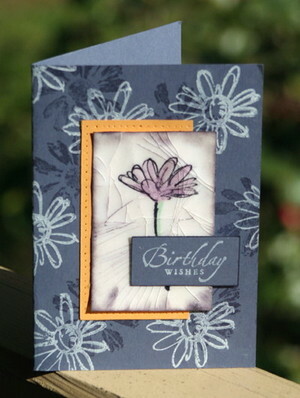 The scallops on this card were done using the Small Corner Rounder (page 140, $13.50), which is also retiring. It also features the Riveting set (the circle greeting) which is retiring as this was a hostess set and these are changed over each year. A lot of you will recognize this gorgeous set Mixed Bouquet (page 74, $57.95) as I have used it a lot in workshops to demonstrate the technique I have used here, crayon resist. 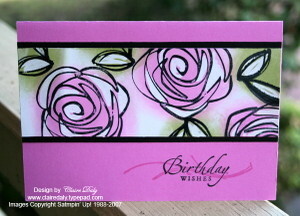 I actually have a free downloadable tutorial here showing you how you can use this set to make a set of matching cards. Finally, we have this card. This set isn't actually retiring (it's Petal Prints), but it does show two more of the In-colours which are going, Marigold Morning and Vintage Violet. How will I ever manage without Vintage Violet? I have already stocked up on cardstock and re-inkers! Have you seen something you like? Email me today and I can put your order straight through so you don't miss out. The good thing about releasing the list early is that you also get to take advantage of the Saleabration sets when you order! If your order of retired product totals $100 or more before postage, you can choose a free set from the Saleabration brochure. Just email me in time for me to get the order in this Friday 29th February. This Friday is also the end date for the two great Saleabration specials for anyone considering on joining Stampin Up as a demonstrator. Exciting things are happening in my team in 2008, and you could be apart of it! My team is also the team that coordinates Paperific each October, so that can be a great boost to your business if you choose to participate. We still have time to express post your demonstrator application to Stampin' Up! so you get to take advantage of the offers for an extra free stamp set and 10% discount if you have Scrapbook Creations Issue 49. Email me today if you would like further information and I can call you back. Have been wanting to make this card ever since I saw the one on Marelle's blog, so this card is a case of the one she did a few weeks back. I changed the colours and added a circle thingy cos I'm into circles at the moment! Since Riveting is retiring, I got Circle of Friendship so I could keep up my circle obsession. The actual card is straight I promise - just scanned it crooked (that's my story and I'm sticking to it). 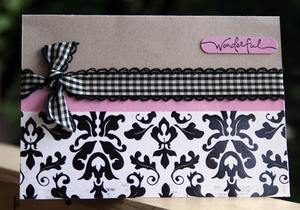 This is the elegant Stampin' Up! Stem Silhouettes set. The base colour is Really Rust, and the other colours Confetti Cream and Close to Cocoa. I have stamped off Close to Cocoa once on the cream card and then stamped the other image in Chocolate Chip. The highlight circle and greeting are Chocolate Chip on Sage Shadow. 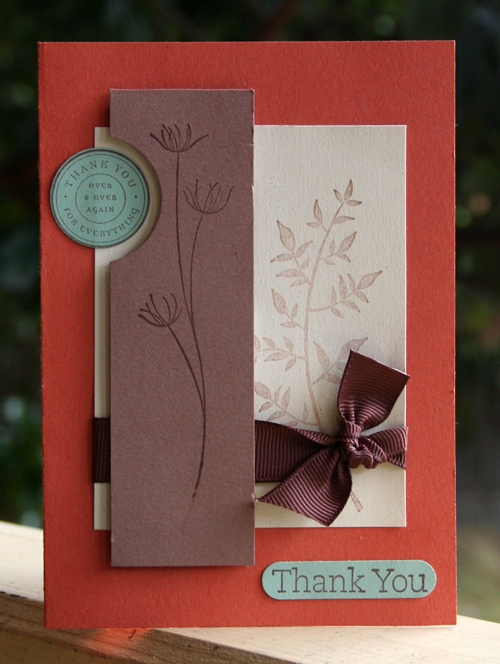 The circle greeting is from Circle of Friendship and the 'thank you' is part of the Stem Silhouettes set. Happy Thursday everyone. I hope you are having a happy day today. If not, I hope you can find some way to 'stop and smell the roses' today. It's a mild sunny day in Melbourne, my favourite kind of day. Here's my creations from the last few days. 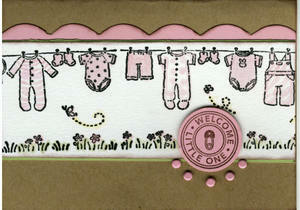 This first one is a Stampin' Up! card I made using the Touch of Nature set. The image has been watercoloured using the Watercolour Wonder Crayons - I think I used Creamy Caramel, Ruby Red, Always Artichoke, Chocolate Chip and Blush Blossom. I used the Blush Blossom as a shadow around the image as I find that breaks the contrast between the image and the paper. The image is mounted on True Thyme cardstock and I have used the faux stitching technique around the edge. Basically this is small holes made with the paper piercer and joined up with the fine end of the marker. Much quicker than setting up the sewing machine! 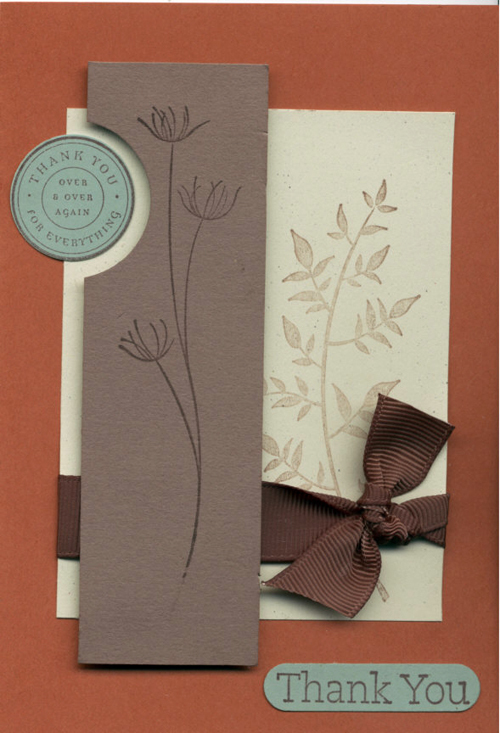 The paper is the Recollections and the cardstock colours on the bottom two layers are Kraft and True Thyme. The scalloped edge was made using the Slit Punch. Have added some Chocolate Chip wide grosgrain and some Antique Copper Hodgepodge to finish off. Next I have a couple of non Stampin Up creations. Some of you may be surprised I am promoting other product lines on my blog. I prefer to look at it as a true reflection of how I create. Stampin Up is by far my preferred choice of stamps, ink and cardstock and I have used many of the papers and accessories as well in my creations. I also have some other favourite companies that I mix and match with my Stampin' Up! products, and my customers tell me that's how they like to use our products as well. You've asked for some samples of ALL my creations, so here you are. I made this card for a girlfriend who has just got a new job. These are the new making Memories 4th Avenue papers mixed with Stampin' Up! Kraft cardstock. The greeting is Stampin' Up! Warm Words set cut out with their Word Window Punch. 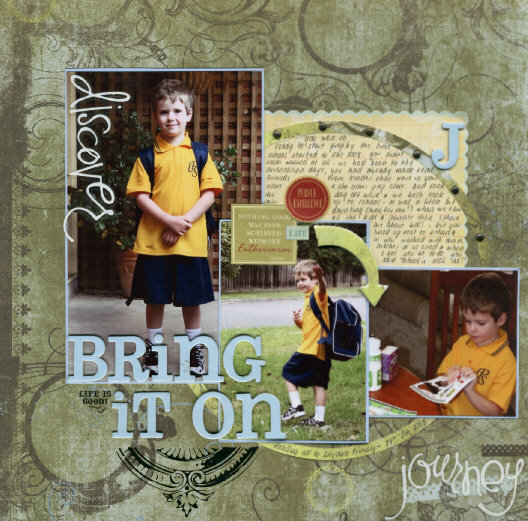 I also did this layout yesterday of Josh's first day at school. He doesn't go to school on Wednesdays, so we scrapbooked together all day. There's a mix of all sorts of stuff here that I had lurking in my supplies. Finally if you got this far, I want to tell you about an amazing blog by Kristina Werner. 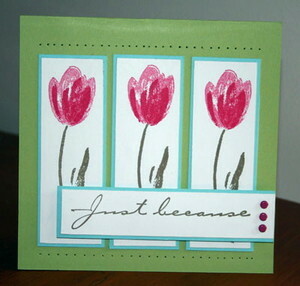 Kristina is a graphic designer and actually works for Stampin' Up!. She has this great feature on her blog where she does a video tutorial called 'Make a Card Monday' where she walks you through a card step by step on video. This weeks one is 8 minutes long and among other things shows you how to mount the stamps, use the Stampamajig, watercolour (although I just leave the crayons in the tin), and to stamp images behind windows using the punches. I LOVE her blog and her designs and I think you will too. I have many great blogs in the left hand column and I will be featuring more of my favourites in coming weeks. Be back soon with more creations. Today I have both boys home as Josh has already managed to get his first dose of school sores in just three weeks. I am hyperdosing him on fruits and veggies to build up his immunity!